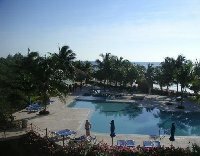 During our holiday in Mexico we stayed at the Akumal Beach Resort in Akumal, south of Cancun and Playa del Carmen. Akumal is also pretty close to Tulum, famous for its impressive Maya remains. 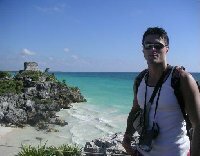 On one of the travel pictures you can actually see the site of Tulum looking out over the amazing Caribbean Sea. 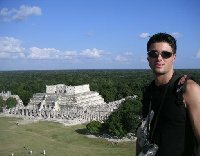 Photos of the Maya ruins in.. The resort was actually pretty nice and not as huge as most hotels in this part of Mexico. The other guests were also pretty laid back which created an ideal atmosphere of total relaxation. The animation team was professional and didn't force anybody into any activities. If you didn't want to partecipate you could just lie on the beach or spend your time how you'd liked to. The Akumal Beach Resort had an All Inclusive formula which was great and there was always plenty of food and drinks to choose from. From Akumal we booked several excursions to the different Maya sites of Tulum, Cobà and of course the site of Chichen Itza, world famous for its beautiful pyramid temple. We spend about half a day in Tulum and the other Maya sites which were all gorgeous and very impressive. We also visited Cancun which seems to be transformed into one big touristic resort. Photos of the site of Tulum,..
Exept for the excursion to the site of Tulum we used a rental car to get from one site or town to another. This way we managed to save a lot of money and see much more of the area. To get to Cancun from Chichen Itza we drove along the inland roads which showed us a completely different side of Mexico and the sometimes terrible conditions in which the locals live. The Akumal Beach Resort in..
Driving through to Cancun the contrast between the two parts seemed to get bigger by the second. Cancun is filled with huge buildings and luxurious resorts and hotels that it almost feels like a different type of Mexico. In Cancun you will also find the famous Coco Bongo club, known for its appearance in the movie The Mask. Did you enjoy The ancient Maya sites around Akumal and have you been on a holiday in Akumal, Mexico? Photos of the site of Tulum, Mexico. Photos of the Maya ruins in Mexico. Photos of the Coco Bongo Bar in Cancun. The Akumal Beach Resort in Akumal, Mexico. Photos of Chichen Itza in Mexico. Liked: The beach and the archeological Maya sites.